Views: Runway 19 landings and departures, aircraft taxiing to runway 19, runway 01 departures and landing rollouts. Directions: From NYS Route 7, turn south on Albany-Shaker Road, take your first left on Sicker Road, then follow Sicker Road to the dead end. Security: Albany County Sheriff’s Department patrols the airport perimeter and occasionally will approach spotters. As always, carry your ID and be polite. Photography: 70-200mm will work at this location for aircraft on the runway. Taxiing aircraft will require 50mm or wider, though longer lenses can be used for head-on or tighter shots. Photography is good for the afternoon. Notes: You need to shoot over or through the chain-link fence at this location. There is a gate at the dead end that has room to stick a lens through. Directions: From NYS Route 7, go south on Old Niskayuna Road, then right on Sicker Road. Pull off in the turn-around near the end or pull off the road adjacent to Allied Waste and the Control Tower. Security: Albany County Sheriff’s Department and Colonie Town Police have occasionally approached spotters at this location. More often, they drive by and wave. Always carry ID and be polite. This location is on public property. Photography: 100mm is enough for aircraft on the runway. More length is needed for departures off of runway 01 once airborne. For aircraft on the ground, you need to shoot through a chain-link fence. For runway 01 departures, you can get pictures of the departing aircraft once they get above the fence. This location is good for the morning. Views: Good for runway 01 approaches. Directions: Follows signs for the airport. A small parking lot is off of the north side of the road at the south end of the airport. Security: There are no reports of police approaching spotters at this location. As always, carry your ID and be polite. Photography: Best -suited for 70mm and up. Only airborne aircraft at this location. 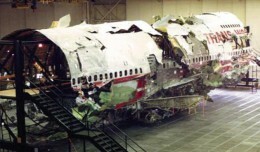 Though visible, runway shots are obstructed by two chain-link fences, and step-ladders are NOT recommended, as it is considered a safety concern. This location is good for the afternoon. Notes: This location is popular with families and people waiting to pick-up passengers. Views: This location offers you ramp views of the gates in the B&C terminals and more distant views of the A gates and yet more distant views of both runways. The observation deck is a semi-circle giving views to the west and around to the southeast. Directions: Located on the third floor of the passenger terminal, you can just take the stairs that are just to the left of security or take the elevator. Security: There are no reports of spotters being approached in this area that is commonly occupied by other people waiting for flights. Always be courteous and carry your ID. Photography: 70mm and up will be required. Reflection in the glass may affect photography, and heat haze will sometimes affect shots as well. Notes: It is common for ATC audio to be piped into the obersation deck’s PA system. Views: This spot offers arrival and departure views for runway 28. The taxiway is close, but partially obstructed. Directions: From NYS Route 7, go south on Wade Road, then right on Old Niskayuna Road (turn at the tank/helicopter monuments), then take the road to the end. Security: Albany County Sherrif’s Department and Colonie Town Police have occasionally approached spotters in this location, though they more often drive by and wave. As always, carry your ID. This location is on public property. Photography: 100mm and up, though you can use wider for taxiing aircraft through some obstructions that may interfere. Location works anytime during winter, or afternoons in the summer. Notes: Runway 28 is usually used only when there is a strong westerly wind. A ladder is helpful, and snow banks become handy. Albany International was the first, and remains the oldest, municipal airport in the United States. In 1908 the airstrip was located on a former polo field on Loudonville Road, three miles (5 km) north of the city in the town of Colonie. In 1909, the airport was moved to Westerlo Island, which is in the city of Albany, but at that time was in the town of Bethlehem; the airport was named at this time. The airport was named after Teddy Roosevelt’s son, Quentin, a fighter pilot during World War I. A $10,000 prize was established for sustained flight between Albany and New York City; Glen Curtiss achieved this feat on May 29, 1910. Other early pioneers of aviation that stopped at this early field were Charles Lindbergh, Amelia Earhart, and James Doolittle. Mayor John Boyd Thacher II once said “a city without the foresight to build an airport for the new traffic may soon be left behind in the race for competition”. He therefore decided to build in 1928 a new modern airport on the Shaker site near Albany-Shaker Road in Colonie, not far from the original polo fields used as the first site of the municipal airport. The Shakers not only sold the land used but also loaned the use of tractors and tools. The early Albany Airport was often closed and threatened with closure which prompted repeated improvements in the late 1930s and 1940s. The airport was closed from January 1939 until December 1940, when it reopened to traffic during daylight hours only, and then with no restrictions since January 1942. The airport has not been closed (other than for weather related reasons and emergency landings) since. The airport up until 1960 had been jointly owned and managed by the city and county of Albany. It was in 1960 that Mayor Erastus Corning 2nd ended the city’s stake. In 1962, a new terminal building was opened. There was a landside building that contained ticket counters, a coffee shop, and baggage claim on the first floor, and a restaurant, offices and viewing area on the second floor. A single-story boarding concourse extended outwards from this building. In 1968, this concourse was widened to allow more concessions and boarding space. The terminal was expanded again in 1979, with the addition of a new two-story building attached diagonally to the northwest. It contained boarding gates for Allegheny Airlines on the second floor, and baggage carousels on the first floor. At the time of US Airline Deregulation in 1978, most of Albany’s service was provided by two “trunk carriers” (American Airlines and Eastern Air Lines) and one “local service carrier” (Allegheny Airlines, which renamed itself USAir in 1979). After Deregulation, many new airlines expanded to Albany. Most did not survive the tumultuous 1980’s. Braniff International Airways, which added Albany as part of an unsuccessful large expansion in 1979. Albany was the only Upstate New York market served by this colorful and storied Dallas-based airline, which shut down in 1982. Empire Airlines (1976-1985), a regional carrier based in Utica, opened a hub at Syracuse Hancock International Airport after Deregulation and operated flights from Albany and numerous destinations in the Northeast with a fleet of large regional jets and turboprop aircraft. Mall Airways, a commuter carrier, ran a hub at Albany in the 1980s with small turboprop aircraft, and operated flights around the Northeast and into Canada. Peoplexpress Airlines, a low-cost carrier founded in 1981 with a hub at Newark International Airport. People grew quickly into a major carrier, but some bad decisions led to its downfall and purchase by Continental Airlines in 1986. Continental’s Continental Express and Continental Connection affiliates serve Albany today. Piedmont Airlines, a pre-deregulation local service carrier based in North Carolina, expanded to the Northeast with a hub at Baltimore-Washington International Airport. They served Albany from this hub. They also bought Empire in 1985 and merged them into itself. In 1987, Piedmont was bought by USAir who wanted to eliminate the unwelcome new competition. Piedmont Airlines, now a wholly owned subsidiary of US Airways and operates under the name US Airways Express, provides US Airways with all ground handling services at Albany International Airport. Piedmont Airlines still operates flights in and out of Albany International Airport, but its aircraft are branded with the US Airways Express logo. Republic Airlines (1979-1986), an airline formed from the merger of three pre-Deregulation local service carriers, added service from Albany to their Detroit hub in 1984. They were bought by Northwest Airlines in 1987; Northwest was bought by Delta Air Lines in 2008 and will be merged into them later in 2009. United Airlines, which had long served Rochester and Buffalo, added Albany and Syracuse in 1982. United and its affiliates serve Albany today. During 1986-1987, the airline industry consolidated through a series of mergers, so that after 1989 the US airline industry was dominated by a group of six “legacy carriers:” American, United, Delta, Northwest, USAir, and Continental. All of them served Albany themselves or by their regional affiliates. During the 1990s, Albany and other Upstate markets enjoyed little low-fare service, and the legacy carriers mostly kept fares high. Southwest Airlines’ entry into Albany in 2000 ushered in a new era of low fare service at the airport. Some content on this page from Wikipedia, Albany International Airport. After a 37 years absence, Air France is once again offering scheduled flights between Paris and Cambodia, making them the only European airline to operate flights directly to the country. Beechcraft Bonanza + unexpected IFR conditions + crummy handheld GPS + high terrain = Better stop at Walmart for new undies on the way home. 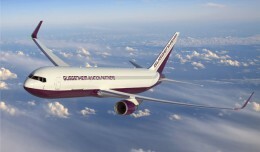 Boeing will convert three 767-300ER passenger aircraft to freighters for Guggenheim Aviation Partners. The annual Atlantic City Airshow will take place this coming Wednesday, August 19th between 11am and 3:30pm.